Asotin comes from an Indian word meaning "eel creek." Clarkston was named for Captain William Clark, while across the Snake River in Idaho, Lewiston was named for Captain Meriwether Lewis. See the Clarkston map. The town was first a Nez Perce winter camp. White settlers came in 1875. Early in the story, there was Asotin and Asotin City. Rivals, as one might surmise. In 1883 Asotin became the county seat and then merged with Asotin City. The Church of Christ that was once located here has left little history. The Disciples of Christ Year Book reports 25 members in 1892. Orval Peterson lists them among the active churches of 1897. The small building was located on Madison between 2nd and 3rd, an address no longer available because of the development of Washington Street. Closed at Asotin, Wash., May 2. Total additions, 143; baptisms, 113. Only 15 children among them. Bible School increased from fifty-four to 200.... O. G. Shanklin, of Montana, is now located as minister. -- Christian Standard, June 4, 1910. By 1936 the church had ceased to meet and the property was sold. It is very probably that remaining members drove to either Clarkston or Lewiston. 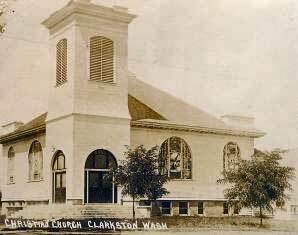 The town was originally named Concord, but was changed to Clarkston in 1900 to honor explorer William Clark. The Church of Christ was organized March 1899 by George F. Stivers of Garfield. There were 16 charter members among whom were Mr. Jerome Pedigo, Mr. and Mrs. J. S. Fisher, Mr. and Mrs. William Reed, Mr. and Mrs. W. E. Baskett and Mr. and Mrs. J. Henry Pedigo. Services were held in the school building, until May 1900 when a new church building located near 13th and Highland was dedicated by J. B. Daisley of Pomeroy. This site was chosen because the majority of the members lived in that neighborhood. There was a small congregation of about twenty members at Peola and they were asked for donations to help build this church. Brother M. N. Jeffreys, then living at Peola, donated and hauled six hundred feet of lumber for the building. Soon a Bible School was organized and a choir with W.E. Baskett as director and Mrs. Fred Lytle organist. Prayer meetings were held each Wednesday and the building became the center of neighborhood activities. In the spring of 1902 a short meeting was held by Brother and Sister L. F. Stephens. In 1903 the building was moved to its present location, Tenth and Sycamore and Diagonal Streets and enlarged to a seating capacity of 200. The second building was built in 1913 and incorporated this earlier building. The congregation is affiliated with the Disciples of Christ. Among the early ministers was D. Loyd Morgan, son of Thomas McBride Morgan. Several men have gone in to the ministry from this congregation including historian Orval Peterson, author of Washington-Northern Idaho Disciples.